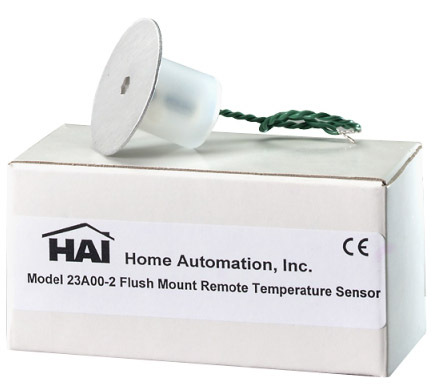 The Surface Mount Remote Indoor Temperature Sensor 23A00-1 from HAI can monitor the temperature of a room. Connect this indoor sensor to you RC Series thermostat and you can sense temperature from a remote location. 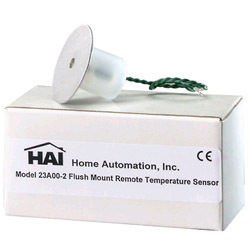 As an add-on sensor, it can display the remote location's temperature on the thermostat's display. As a replacement sensor, you can use it to hide the thermostat in a closet or other location while keeping the sensor in an optimum location for temperature sensing. This small Remote Indoor Temperature Sensor that can be flush-mounted into the drywall and painted over to become almost invisible in a residential installation and will work with all the Omni family home control system.